Guam Rail Gallirallus owstoni ? Mariana Fruit-dove Ptilinopus roseicapilla ? Puerto Rican Spindalis Spindalis portoricensis ? ^ "Alabama State Bird". Alabama Emblems, Symbols and Honors. Alabama Department of Archives and History. 2006-04-27. http://www.archives.state.al.us/emblems/st_bird.html. Retrieved 2007-03-18. ^ "Official Alabama Game Bird". Alabama Emblems, Symbols and Honors. Alabama Department of Archives and History. 2003-11-17. http://www.archives.state.al.us/emblems/st_gbird.html. Retrieved 2007-03-18. ^ "Alaska State Bird". Alaska History, Geography, Population and State Facts. Fact Monster. http://www.factmonster.com/ipka/A0108178.html. ^ "Arizona State Bird". Arizona State Bird- Cactus Wren. 50 States. http://www.50states.com/bird/cactus.htm. ^ "Arkansas State Bird". Arkansas State Bird- Mockingbird. About. http://homeschooling.about.com/cs/unitssubjgeog/p/susarbird.htm. ^ "California State Bird". California State Bird- California Quail. 50 States. http://www.50states.com/bird/quail.htm. ^ "Colorado State Bird". Colorado State Bird- Lark Bunting. About. http://homeschooling.about.com/cs/unitssubjgeog/p/suscobird.htm. ^ "Connecticut State Bird". The State Bird. State of Connecticut. http://www.ct.gov/ctportal/cwp/view.asp?a=885&q=246480. ^ "Delaware State Bird". California State Bird- Blue Hen Chicken. 50 States. http://www.50states.com/bird/bluehen.htm. ^ "District of Columbia State Bird". Washington DC State Symbols. 50 States. http://www.50states.com/dc.htm. ^ "Florida State Bird". Florida State Bird: Mockingbird. SHG Resources. http://www.shgresources.com/fl/symbols/bird/. ^ "Georgia State Bird". Georgia State Bird Brown Thrasher Toxostoma rufum. Netstate. http://www.netstate.com/states/symb/birds/ga_brown_thrasher.htm. ^ "Georgia Secretary of State - State Game Bird". Georgia Secretary of State. State of Georgia. http://sos.georgia.gov/state_symbols/state_game_bird.html. ^ "Hawaii State Bird". The Nene Goose- Branta Sandvicensis-Hawaii's State Bird. Aloha-Hawaii. http://www.aloha-hawaii.com/hawaii/nene/. ^ "Idaho State Bird". Georgia State Bird Mountain Bluebird Sialia currucoides. Netstate. http://www.netstate.com/states/symb/birds/id_mountain_bluebird.htm. ^ "Illinois State Bird". State Symbols. Learn Illinois. http://www.state.il.us/kids/learn/symbols/. ^ "Indiana State Bird". Indiana State Emblems- cardinal. Indiana Historical Bureau. http://www.state.il.us/kids/learn/symbols/. ^ "Iowa State Bird". Iowa State Bird Eastern Goldfinch Carduelis tristis. Netstate. 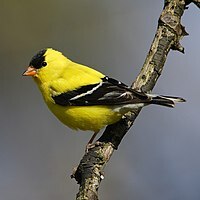 http://www.netstate.com/states/symb/birds/ia_eastern_goldfinch.htm. ^ "Kansas State Bird". Kansas State Bird Western Meadowlark Sturnella neglecta. Netstate. http://www.netstate.com/states/symb/birds/ks_western_meadowlark.htm. ^ "Kentucky State Bird". Kentucky's State Bird: The Cardinal. Kentucky Department for Libraries and Archives. http://www.kdla.ky.gov/resources/kystatebird.htm. ^ "Louisiana State Bird". Louisiana State Bird: Brown Pelican. SHG Resources. http://www.shgresources.com/la/symbols/bird/. ^ "Maine State Bird". Maine State Bird, the Chickadee. Wells Maine. http://wellsmaine.com/scenic/chickadee.html. ^ "Maryland State Bird". Louisiana State Bird Baltimore Oriole Icterus galbula. Netstate. http://www.netstate.com/states/symb/birds/md_baltimore_oriole.htm. ^ "Massachusetts State Bird". Massachusetts State Bird: Chickadee. SHG Resources. http://www.shgresources.com/ma/symbols/bird/. ^ "Michigan State Bird". Michigan State Bird American Robin Turdus migratorius. Netstate. http://www.netstate.com/states/symb/birds/mi_american_robin.htm. 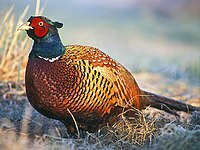 ^ "Minnesota State Bird". Minnesota State Bird Common Loon Gavia immer. Netstate. http://www.netstate.com/states/symb/birds/mn_common_loon.htm. ^ "Mississippi State Bird". Mississippi State Bird: Mockingbird. SHG Resources. http://www.shgresources.com/ms/symbols/bird/. ^ "Mississippi State Symbols, Emblems, and Mascots". SHG Resources. http://www.shgresources.com/ms/symbols/. ^ "Missouri State Bird". Missouri State Bird: Bluebird. SHG Resources. http://www.shgresources.com/mo/symbols/bird/. ^ "Montana State Bird". Michigan State Bird Western Meadowlark Sturnella neglecta. Netstate. http://www.netstate.com/states/symb/birds/mt_western_meadowlark.htm. ^ "Nebraska State Bird". Nebraska State Bird: Bluebird. SHG Resources. http://www.shgresources.com/ne/symbols/bird/. ^ "Nevada State Bird". Nevada State Bird, mountain bluebird. Val-U-Corp Services, Inc.. http://www.val-u-corp.com/articles/nevada-state-bird.html. ^ "New Hampshire State Bird". New Hampshire State Bird: Purple Finch. SHG Resources. http://www.shgresources.com/nh/symbols/bird/. ^ "New Jersey State Bird". NJ Senate No. 241. NJ Home.